Passage from La Havre, France to New York, New York, USA on the Ship the Havre. 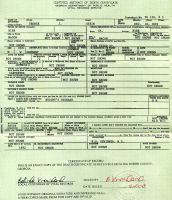 [S00155] ANCESTRY.COM - New York Passenger Lists, 1820-1957, Database Online, (Provo, UT, USA: Ancestry.com Operations, Inc., 2010. ), http://search.ancestry.com/search/db.aspx?dbid=748., 13 Jan 1834, La Havre France to New York, NY.